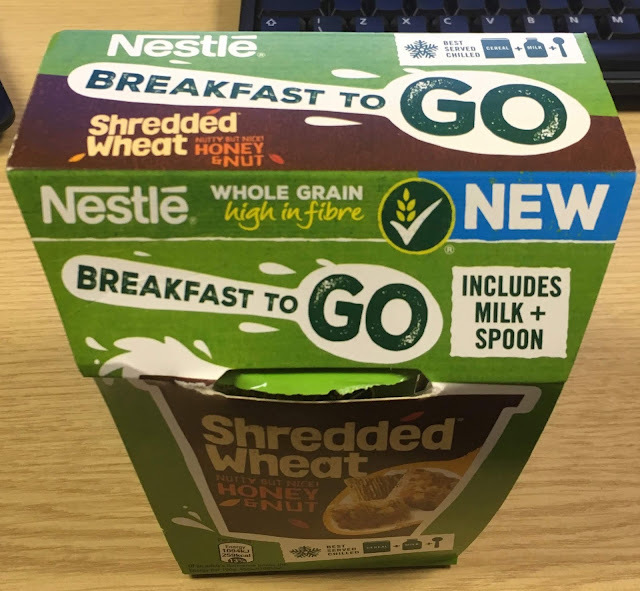 I received this pack of Breakfast To Go Shredded Wheat in one of the wonderful boxes from Degusta. A subscription service where they send you a monthly box of interesting products. I decided to have this for my breakfast at my desk, while catching up on work emails. The pack comes with a pot with Shredded Wheat, a carton of milk and a plastic spoon, everything you need for breakfast. The first thing I did was to try and pour the milk, and this was a struggle. The carton said tear here, but the carton wouldn’t tear by hand. Admittedly I’m not the strongest person in the world, but I’d put myself down as average and I could rip the carton. I’m in an office but I couldn’t find any scissors about (we are paperless, so don’t really have the need for that much stationery). I found a butter knife in the kitchen which I used to create a bit of weakness by sawing at the top and eventually I got it open, with some pulling, enough to get the milk out. It probably is reasonable to assume if you are in an office there are scissors about normally, but these on the go products are designed to be picked up and eaten anywhere, on a train for example, where I assume people will struggle too. My next issue was my pack was labelled Shredded Wheat and the contents were clearly Shreddies. Not an issue for me as I’d be happy with either, but it is still nice to know what you are going to get. The milk is long life and when poured over the cereal you can taste the difference from fresh in the flavour. 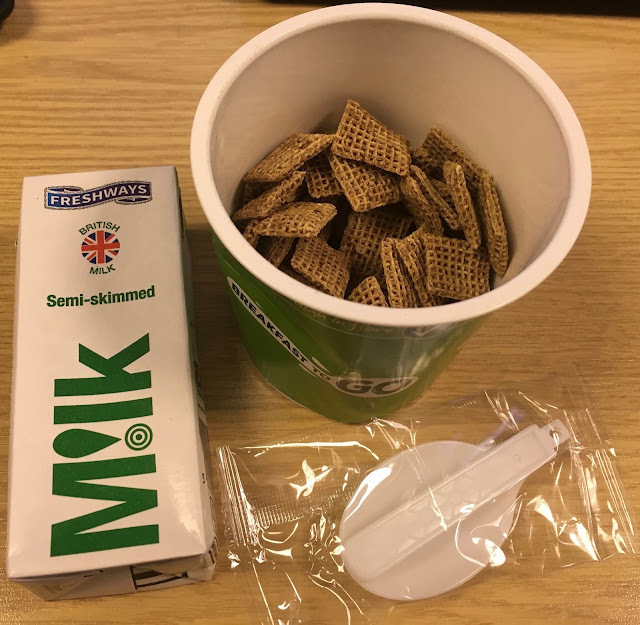 I do from time to time use long life milk in tea or coffee and I can’t tell the difference, but that is for a small splash in a strong drink, on these cereals it stood out a lot more. The Shreddies were nice, but they regular Shreddies. I’m not sure this is something I’d buy to be honest, it is a good idea, but the milk carton was driving me mad!